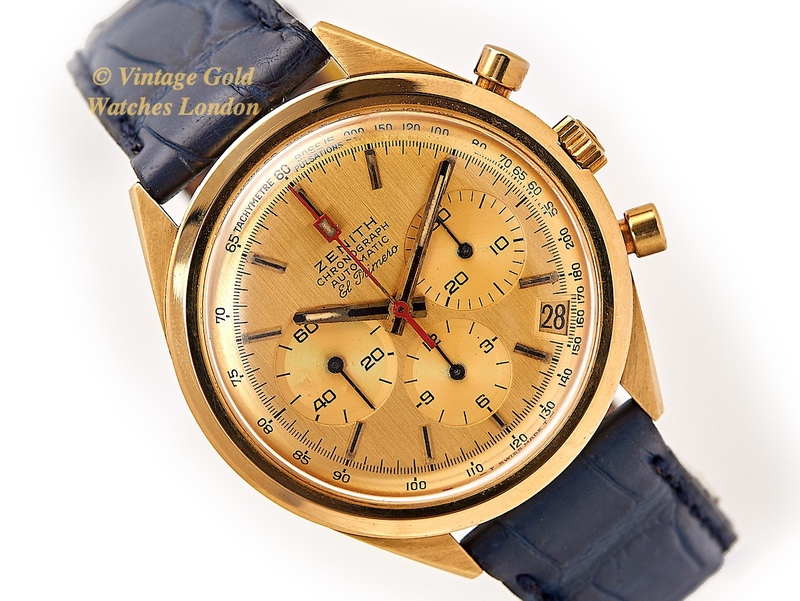 Home / Zenith / Zenith El Primero Chronograph Model G382 18ct 1969 1st Launch Edition, 1 of only 250 Ever Made. Zenith is one of the oldest watch companies, est. 1865 and one of only a handful which still produces its own mechanical movements today. The company has an almost unparalleled record of technical achievements. Notably, in 1929, Zenith won world renown at Kew Observatory (England), when a Zenith wristwatch won first prize for accuracy of better than 0.6 seconds per day. During the late 1940s and throughout the 1950s, Zenith held a lead in producing many of the most commercially successful, and technically advanced, chronograph wristwatches. The technical expertise and craftsmanship which went into these watches were immense. Just a brief look inside the case back of any chronograph is enough to demonstrate how complicated these watches are, – making these very expensive watches to produce. Zenith has also been recognised with more than 1500 awards and has over 50 individual movement designs to its name, making it the Swiss brand with the most awards for precision. Put simply, in 1969 Zenith produced the world’s first automatic chronograph, the El Primero. This watch, from 1969, is from a limited edition production run of only 250 ever made. It is historic and one one of the rarest and most desirable chronographs ever produced. This is also a true ‘time capsule’ piece, by which we mean it has seen little to no real use and has always been kept in pristine condition. Model Ref G 382, Calibre 3019 PHC, Produced 1969 to 1970, Case Number 009E465, making this the 9th production example of only 250 pieces ever made. As some will know, there has been some debate over what would seem to be the relatively straightforward question.. Namely, which company (or group of companies) was the first to produce an automatic chronograph? It was a close run thing, what is not in dispute is that on January 10th 1969, the Zenith-Movado group publicly announced to the press, and demonstrated, and showed, the world’s first working example of its automatic chronograph. To underline the significance of this momentous achievement and event, Zenith named its watch the El Primero – meaning: The 1st! It was not until March 3rd of the same year that their main competitor, led by Heuer and Breitling, unveiled its first working examples to the world. It is also true that both groups used the Basel Fair, held in April 1969, to officially launch their competing models. However, due to the considerable technical challenges of manufacturing its much superior movement, Zenith took a little longer to achieve serial production, while Heuer-Breitling delivered 100 pre-production prototype Chronomatics to its major distributors in April-May 1969. However, although the Chronomatic was widely promoted, retail availability followed sometime later, exactly when is unclear. Retail availability of the El Primero commenced in October 1969. So as you may see, the answer to this question depends precisely on the criteria and how you look at it. Although which manufacturer was first to produce the world’s first automatic chronograph may be open to conjecture, there is no doubt the Zenith El Primero was the far greater technical achievement. A high frequency 36,000 bph, column wheel, automatic chronograph, of integrated construction, with a 50-hr power reserve, and a quick-set date function was an amazing achievement in 1969! Not only this, but the El Primero was, and also remains, the only mechanical movement ever able to measure time intervals to within a tenth of a second. In fact the 31 Jewel movement was so advanced and such a technical tour de force, that when in 1988 Rolex decided to replace its ageing hand-wound Valjoux Cal.72 movement in its Rolex Daytona chronograph with an automatic movement, it chose to buy and fit the Zenith El Primero movement. Rolex then continued to use this movement until the year 2000, when it finally began to produce its own chronograph movement for the first time! As expected the movement of this watch in first class condition. It has been fully overhauled and serviced by our vintage chronograph specialist master watchmaker. This involves complete disassembly of the movement to each of its component parts. It was then cleaned and closely examined under high magnification, then re-assembled using only the correct Zenith replacement parts where necessary, and specified oils and adjustments as required, before final testing, and calibration. Following careful timing and calibration in 6 positions, this watch is currently running within +4 seconds per day averaged over 6 positions. This is truly outstanding for any watch of this age. This movement also has a 50-hour power reserve when fully wound. We are therefore more than pleased to offer 12 months’ warranty on this watch movement*. The movement is correctly signed Zenith, Swiss Made, with the Calibre number 3019 and 31 Jewels. *Please note – our 12 months’ warranty is only applicable if the full list price is paid. Only 250 pieces of El Primero G 382 model in 18ct gold, with the all gold dial, were ever produced. 700 of the G 381 with gold cases and White dials were also produced. Whereas 2,500 of each, of the steel cased A 384, A 385 and A 386 models were produced, making 7,500 in total. This is the original, unrestored dial. It has applied baton hour indices with remaining original lume. The hands are also original with remaining original lume. As this is a gold dial it has not suffered any degradation over time at all and so we have left the dial and the original hands, totally untouched. As can be seen, each is in amazingly good condition. The hands are not quite as perfect as the dial, but for the sake of the originality and because this is a very special watch, we have left these as they are. If you wish to buy this watch and you would prefer us to restore the hands, we could do this, although we would recommend against. The outer scale is known as a Tachymeter scale and can be used in conjunction with the chronograph function to measure speed, or distance travelled. Also a Pulsations scale for measuring heart rate. The 18ct yellow gold watch case measures 37mm, excluding the original Zenith signed winding crown. The case is in almost perfect condition with no evidence of anything other than very careful and gentle hand-polishing. It is completely scratch free and the lugs are sharp, with almost new edges. The chronograph pushers are also in immaculate, indicating the watch has seen very little use. The inside of the case-back is correctly signed; Zenith, Swiss Made with Swiss Geneva 18ct hallmarks. Externally, the case-back carries the case serial number 009E465. The case-back is of full thickness, has never been engraved and also shows no signs of wear visible to the naked eye. An original new Zenith high quality Blue Crocodile strap is fitted with the original Zenith gold buckle. Although there are no original papers with this watch, the numbers and markings on the watch are all correct, dating the watch to 1969. Detailed particulars will be included with our purchase receipt and 12 months’ warranty*. A separate insurance valuation for the replacement value of this watch will also be provided at the time of sale along with our unique ‘Lifetime Authenticity Guarantee’ which states: “If this watch proves to be anything less than totally authentic, or not as described, Vintage Gold Watches of London will offer you a full refund at any time”. The watch will be supplied with a new, high quality, hardwood presentation box, as shown. This truly one of the most magnificent and important vintage chronograph watches from one of the absolute leaders in its class. We think the price is most realistic, perhaps even a little generous considering the market for important chronographs, in recent years. A word on our prices – We always try our hardest to acquire the very highest quality watches we can find, before restoring these to the highest possible standards. We then offer these at the fairest prices we can, taking into account our pre and post sales care and service. This approach means we will never be the cheapest, but nor will we be the most expensive. Indeed there are some well-known stores in West London which are highly successful charging between two to three times the price you see here. We therefore consider our prices to be fair, given the quality of watches we have to offer.